1) Wendy’s Lobster and Caviar Burger – Because nothing says fancy like Wendy’s! 2) Dunkin’ Donuts Bacon and Eggs on a Donut – Start your day with everything you love. 3) Burger King Bacon Sundae – Everything tastes better with bacon, right? 4) Burger King Black-Bunned Burger – This crazy burger released in Japan has charcoal in the bun, and squid ink as a condiment. 5) Pizza Hut Cone Crust Pizza – Sometimes a round pizza is just too boring…said no one ever. 6) KFC Mac and Cheese Bites – Had this been around when I was a kid, I’d have been 280 pounds. 7) Pizza Hut Cheeseburger + Chicken Nuggets Stuffed Crust – Umm…What? 8) Taco Bell Doritos Locos Tacos – Every student’s dream late night snack. 9) McDonald’s McLobster – This monstrosity was only released in Eastern Canada. 10) Carl’s Jr Strawberry Pop-Tart Ice Cream Sandwich – Hopefully this is the new cupcake trend. 11) Denny’s Mac ‘n Cheese Big Daddy Patty Melt – This crazy sandwich has 1690 calories. 12) Carl’s Jr. Ice Cream Burger – What can you say, Carl’s Jr. really love them burgers. 13) Denny’s Fried Cheese Melt – This is a grilled cheese with mozzarella sticks on the inside. Also know as heaven on Earth. 14) White Castle Chicken Rings – Onion rings are so 2013. 15) Burger King Pizza-Size Burger – The perfect family dinner. 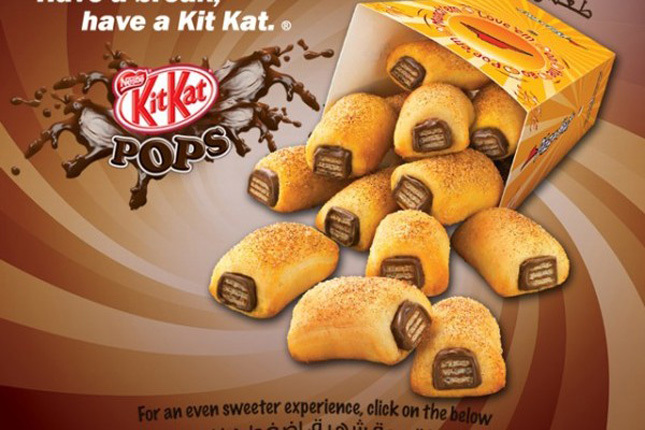 16) Pizza Hut Kit Kat Pops – Everything tastes better deep fried right? 17) Pizza Hut Hot Dog Stuffed Crust Pizza – America’s two favorite things in one! 18) Burger King X-Tra Long Chili Cheese Burger – You’ll be on the toilet for a while after eating one of these. 19) Cinnabon Pizzabon – Compared to some of these other items, this seems so small and cute. 20) KFC Shrimp Stars – Ninjas love KFC too. As crazy as these are, I know you were licking your lips over some of them. Source: brit.co Make your friends hungry by sharing these unusual fast food items with them below…or make them gag.